With no shortage of boring toys filling up capsule machines these days, it's genuinely exciting when the vending toy gods occasionally decide to offer up some truly special bits of plastic. 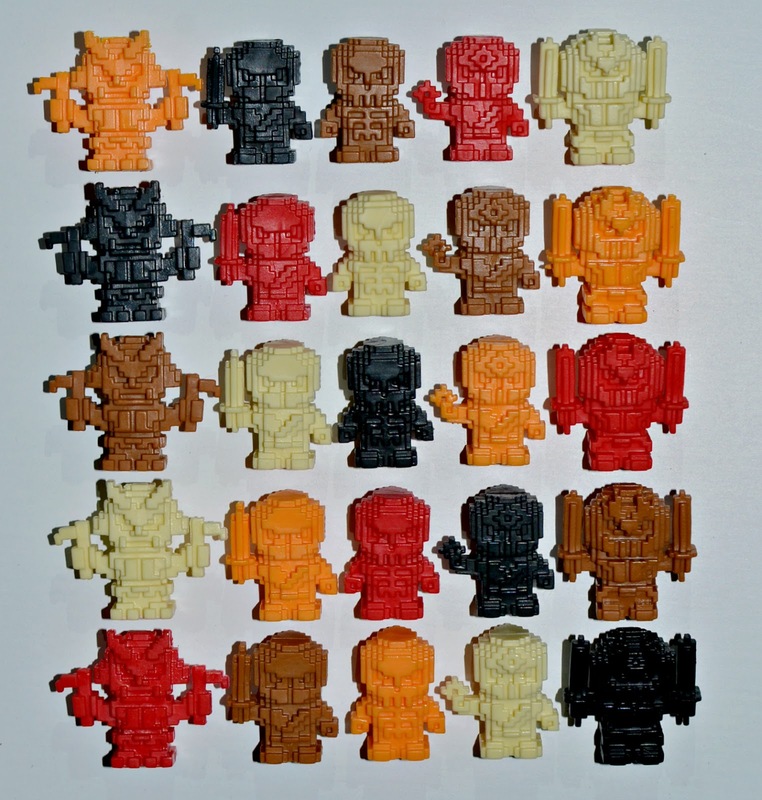 The latest example of vending greatness comes in the form of tiny figures called Bit Figs, and in this case the toy gods responsible are Onell Design, who brought them to plastic life -- and into capsule machines through a collaboration with SSM Vending. 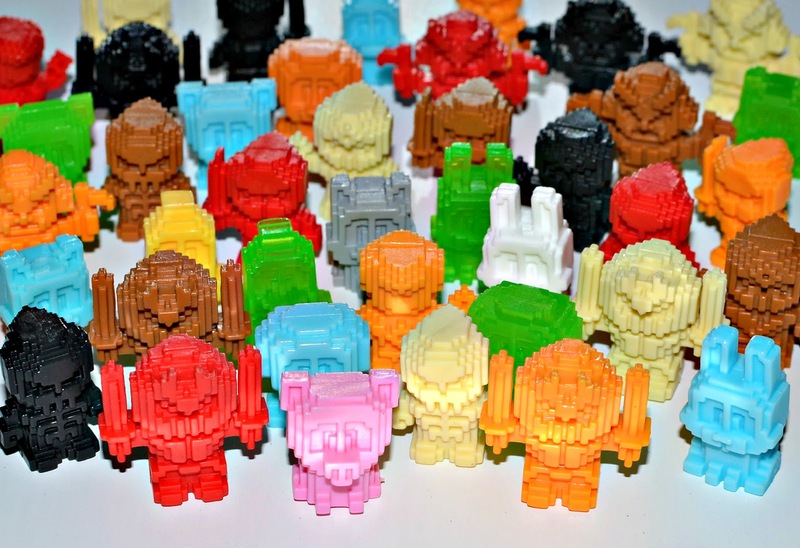 The concept behind Bit Figs is old school-styled pixel art made into 3-D mini figures. Each figure is about three quarters of an inch tall and compatible with Onell's Glyos System, with two different sets available so far -- Ninjas and Animals. 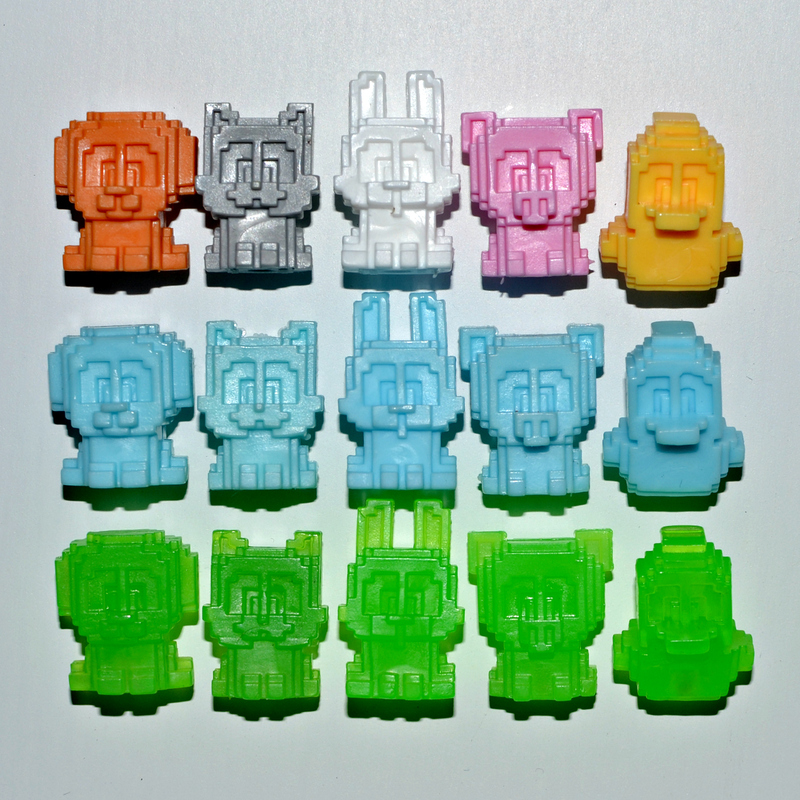 In addition to trying to hunt them down in capsule machines, you can order them online here. "...There were 2 things that dominated playtime as we approached the '90s - Nintendo and TMNT. If we weren't crashing our mutant action figures into each other, we were smashing buttons trying to survive even 10 minutes of Ninja Gaiden. 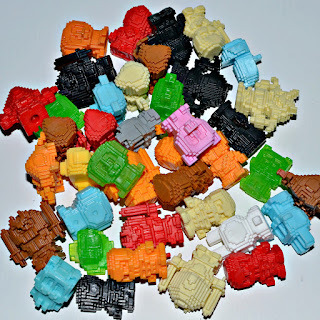 Throw in a handful of Lego sets and Monster in My Pocket mini figs and you pretty much have our childhood in plastic...These innocent memories are what fueled the concept behind Bit Figs." The creators' passion definitely comes through in the figures. They're tons of fun. There are five different sculpts that make up the Ninjas set, and they each come in five basic monochromatic colors -- red, black, orange, off-white and brown. You can also find less common variants with minor painted details randomly included in assortments. There's been additional limited monochromatic colors produced as well, including "Pheyden" light blue and clear green. These guys even have individual names. Looking at the photo to the right, the figures in each row from left to right are: Oni, Tana, Ku, Iken and Urai. My personal favorites are the skeleton-like Ku and and Oni. 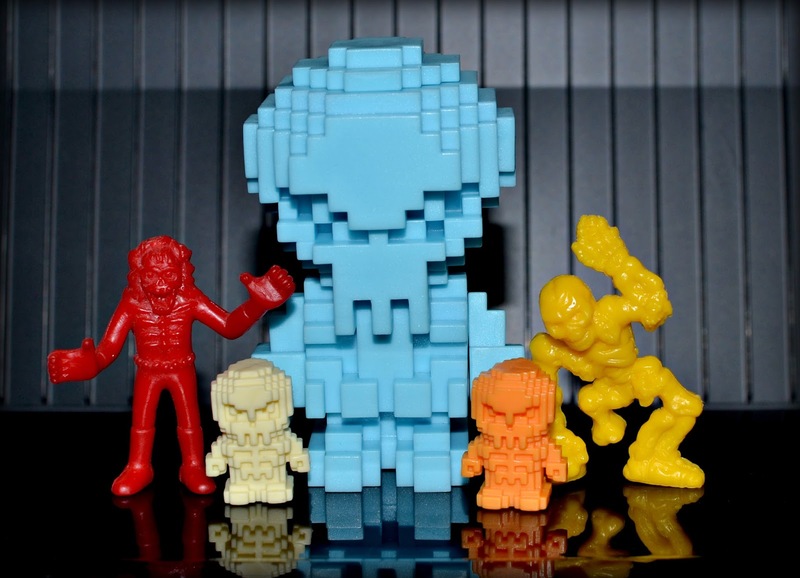 Ku, especially, is the kind of figure that would be fun to build an army of in a bunch of different colors. Next we have a set of five Bit Animals, which are also really well designed and pretty irresistible. They are Bit Pup (dog), Bit Kit (cat), Bit Bun (rabbit), Bit Pig and Bit Duck. There are five colors -- light brown, gray, white, pink and yellow -- but unlike the Ninjas, in the basic assortment each animal is only available in one of the colors (for example, all pigs are pink). That said, there are painted variants as well as the limited Pheyden blue and clear green colors. These designs have a really appealing simplicity about them, while at the same time somehow being packed with personality. Onell has also given its Pheyden character the Bit Figs treatment. 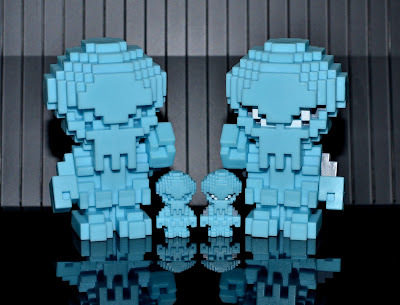 Bit Pheyden is available online as a set that includes a "Mega" 3 inch tall version with articulated arms in addition to the tiny version matching the other Bit Figs. Mega Pheyden's arms are removable and can be replaced with other parts from Onell's Glyos system. 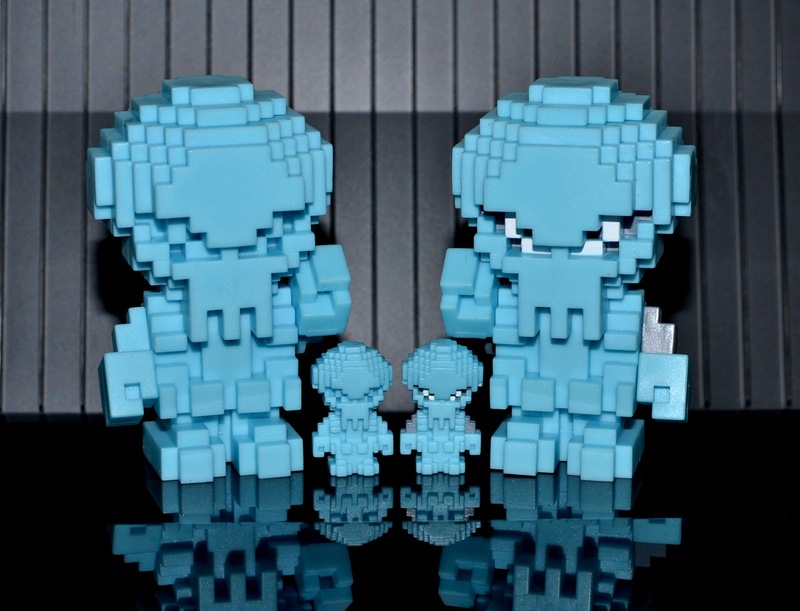 The standard Pheyden sets come in light blue, either monochromatic or with painted details. Onell has also produced a couple limited colors, including clear green and metallic gold. And there you have it...the current offerings from this awesome new line! I am a big fan of Bit Figs and am excited to see where this line goes next. I, for one, would absolutely love to see a monster-themed set. What about you? Have you picked up any Bit Figs yet? I bought a couple of sacks, and I agree - monsters would be great. Or aliens or whatever else. What'd really tickle my fancy would be those Outer Space Men, though. I love the format and the price ain't bad either. I still haven't seen any in vending machines, though. Ooh yeah, the Outer Space Men would be great! Yeah, so many possibilities. Imagine what they could do with Nintendo. I have only seen the Bit Animals in machines and when I have a pocket full of quarters I thought I'd try my luck. 3 white Bit Buns! XD I wish I could find the ninjas in a capsule machine. Oh well, still fun. I have yet to see either set in any capsule machines near me! Would be cool to spot them "out in the wild"
I spotted a machine for 75 cents each, but I just recently spotted a 25 cent each machine! Picked up 2 ducks and 2 pigs this time. Meh. These aren't for me. At all. Especially the animals series. This toy-line has an odd and, to me, entirely unappealing appearance. I get the intended "retro" angle of this toy-line, but personally I'm very pleased by the amazing progress of video-game graphics, and thus I have no interest in retro gaming. These figures look as if they were made with the world's oldest and worst 3D printer, resulting in a choppy and aesthetically-unpleasing appearance. As if that weren't bad enough (which it is), the animals are also cloyingly cutesy. Strike two! These are INFINITELY worse than regular Glyos figures, which have themselves been described as "Legos for hipsters". I don't care for Glyos, and thus I don't own any of them, yet I'd still rather buy a hundred Glyos figures rather than just one of these Bit Figs. If I were to assign this toy-line a letter grade from to A to F, including pluses and minuses, I'd give this line a "D-" at worst or a "D" at best. Just my opinion.